Traveling to Japan? Then learning the language is at the top of your list and "JAPANESE in 10 minutes a day" is the best way to prepare for your trip! 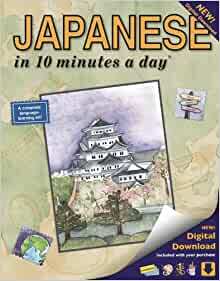 This complete program combines the ever-popular "JAPANESE in 10 minutes a day" Book with interactive software--it's the perfect blend of education and entertainment. Computer activities such as interactive Sticky Labels, Flash Cards and games add a playful twist to learning the language. With your new skills, you'll be able to shop the Ginza, see the sights and make reservations--all in Japanese! Now you're ready for the trip of a lifetime! Perfect for students, international executives and inspired travelers wishing to participate in this rich and ancient culture. Pronunciation Guide: With the Guide and simple phonetics above each Japanese word, it's easy for native English speakers to begin speaking Japanese with the correct pronunciation. Over 300 "Free Words: " Sounding similar to their English counterparts, these Japanese words take no extra effort to add to your vocabulary. Teacher As an expert linguist, Kristine spent ten years teaching German at universities in the United States and in Europe. World Traveler An adventurous spirit, Kristine has explored more than 100 countries, from Bhutan to Zimbabwe, and almost every exotic locale in between. She understands the problems that all travelers encounter, regardless of which country they are visiting. She knows first-hand how languages can open doors to new adventures, new friends and different cultures. Language Scholar Kristine completed her undergraduate and graduate studies while living in Heidelberg, Germany. She then received a second Master's Degree from the University of California in Santa Barbara and subsequently, did her Doctoral studies in Medieval German Languages and Literature. In addition to German, she also speaks a number of other languages ranging from Arabic to Swahili. A Colorful Background Kristine's fascination for languages began as a child growing up in a tri-lingual household in Oregon, where Croatian, Danish and English were spoken. On A Personal Note Kristine's passion for travel, foreign languages and new cultures continues to take her around the world. One never knows where she'll venture to next - Namibia, Laos or Guyana. Kristine is a licensed pilot, a certified diver and an avid downhill skier. She enjoys competitive horseback riding and playing the piano. She makes her home in both Seattle, Washington and in Cape Town, South Africa. Very good book for beginners, although very little about Japanese writing. I suppose it is a good book just for a start on the approach to Japanese language. 4.0 out of 5 starsGreat for beginners. And I do mean beginners. If you're never learned a word of Japanese before, then this is a great (and relatively cheap) starting point. It takes you through the same basics as any other book - common objects, colours, numbers, date and time - but it does it in a far less intimidating way. There are colourful pictures on every page, with all kinds of games and activities, such as crossword puzzles, fill-in-the-blanks, and so on. The book also comes with flash cards, and two pages of little stickers to attach to all the objects in your house. As well as this, there is an abundance of other good ideas. Key words like where, who, what, when, how many....etc are learned straight off the bat, getting you speaking simple sentences as soon as possible. Every page has a strip of Japanese words along the bottom that borrow from the English, for easy learning of things like "aisu kurímu" (ice cream), and "rajio" (radio). The book's instructions on every page contain the Japanese you've already learned, resulting in sentences like "Say each and every tango (word) carefully, pronouncing each Nihongo (Japanese) sound as well as anata (you) can." As you progress, the English translations are dropped from words you're assumed to know. It's a strategy that really helps get these simple terms hammered into your brain. There are bad points to the book too though. Romaji is used throughout, with not a single character of kana or kanji involved. This is done on purpose, to keep things as simple as possible, but it still means that a person completing the book will not be able to write a thing. Also, particle words are used in all the example sentences, but their meanings are mostly ignored, leaving the learner to speak them, and not understand why. But overall, it's a perfect book for what it's designed for - learning the basics, without it ever feeling like a chore. It's ideal for leading into a course, or more complicated textbook. I bought this when I was just starting out with Japanese, but because I move between two countries on a 6-month basis I didn't have time to look at it properly until recently, at which point I had studied enough Japanese to find this to be essentially useless for me. Don't get me wrong - it is a good tool for the person who doesn't know any Japanese at all, but once you learn kana (hiragana and katakana) it is much more useful to have books which are written in kana than books which are written in romaji. The tone of the book is quite patronizing, and I don't like the way they bump random Japanese words into English sentences, because it makes the learner confused about Japanese grammar (which is vastly different from English grammar). I like the stickers though, and how colourful and light-hearted the approach is. It's more like a game than studying, which is refreshing. I read previous reviews and knew what I was getting. This product is great for beginners to get a sense of the sound of Japanese words. Memorizing the words and phrases in the book will be most helpful to the casual tourist to Japan, or the American that meets a Japanese tourist in the U.S. I took three semesters of Japanese at a local community college so I turned this book into an activity by writing-in the Hiragana or Katakana versions of the words plus applicable kanji. Try it, you'll like it. At am just learning japanese for an upcoming personal trip. I have finished learning my kana (hiragana and katakana), and was hoping to expand my vocabulary. I had previously bought the Russian 10 minutes a day, and it introducted to the russian alphabet; so at first I was a bit disappointed when all words were in Romaji and there is no kana or kanji (only a handful). However, after being impressed with the usefulness of the book I realized that it served its purpose and that if practical vocabulary is what you're looking for this is the book for you - again, note that since there is NO kana, you won't recognize the words if written in their native languate (kana & kanji) - but you should understand them - for most of us this is 80% of what we're looking for anyway for casual travel. The CD room is too good, so I got upset that is was relatively little content. The exercises were so well done that it was frustrating that it covered only a limited amount. I guess these are suggestions for future enhancements. but the author did do an excellent job, she should consider a japanese in 30 minutes a day or a volume 2 follow-up. So yes, I recommend this to anyone who has NO prior japanese language knowledge and wants to learn some practical words to help them get around! 5.0 out of 5 starsPerfect for the beginner to Speaking Japanese. I love this I bought one a while ago and used the stickers to label things around the house. I still remember almost every object I labeled! Stickers are a great memory tool. It has flashcards as well you just have to cut them out. It's a great trip guide, all the common tourist phrases and activity things are there. You can shop, deal with money, time, post office and ask for directions. There are tons of pictures and it's very easy to understand. Note: There is no Kanji, or Hiragana or Katakana in this book, it's strictly Romanji ( English letters spelled Japanese words) and some spelled phonetics. It's not for learning the writing system, but it is to learn to speak a little and maybe understand some. You need more work than 10 minutes a day to learn how to write in Japanese characters. Recommended for the beginner either who wants to learn or to help figure out the mistranslations in subtitled anime. Not recommended for someone who needs to read and write, or learn at the college level. Very helpful, I love it. It contains many activities and flashcards, I have a Chinese one too, and I learned many things that it helped during my trip to China and Taiwan. Plus the company that I purchased from was very responsible and attentive. I bought this on the orders of my Japanese teacher. Ir is a good way to get started on conversational Japanese, but there is no writing. My teacher has to supplement this book with other lessons. The CD is fun.